Exciting news to kick off your new semester. It is now possible to print from your laptop, phone or tablet device using Papercut and WebPrint! Thanks to Champlain Information Services who manage our printing solutions, for bringing this initiative just in time for the new year. Head to papercut.champlain.edu, and login using your Champlain ID & password. 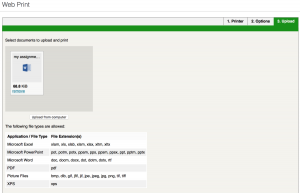 Choose the Web Print option from the left-hand menu, and follow the prompts to upload your document. When you submit your print request, head to any Papercut printer on campus and swipe to release the print job. This entry was posted in Uncategorized on August 30, 2016 by Alan Carbery.